With a peak height of over 8', this 8x8 shed can easily fit in small backyards without sacrificing vertical storage space inside. The 48" wide double doors provide easy access to lawn mowers, wheel barrows and other smaller agricultural equipment. Protected by engineered, treated wood siding and 25 year asphalt shingles, this 8x8 shed will stand up to Mother Nature for many years to come. To maximize your storage potential inside, consider adding a shelf or workbench. Your local building authority may have specific requirements resulting in additional cost. Prices do not include painting, staining, permits, zoning and setback advice and/or compliance, excavation, or leveling beyond 6". All prices and content are subject to change without notice. Promotions are valid with online transactions only and cannot be used in conjunction with promotions at a servicing sales/distribution center or distribution center. Not valid on prior purchases. All stated sizes are nominal dimensions and approximate. Some buildings may be shown with optional items. Additional mileage charges (if applicable) and taxes will be calculated after checkout process is completed. Painted shed is a representation only, arrives primed for painting in a light beige color. We are very pleased with our shed! It's spacious ( we were able to fit a riding mower, push mower and snow blower in there as well as hang some tools on the walls). The builder was here promptly at the agreed upon time and date (even though it was very cold!) We have no complaints at all. Got a great deal on a nice gambrel shed that was delivered and setup on the same day. The installation guys did a great job and it turned out well. About the only minor issue I have is that there is no drip edge on the roof so the plywood edge is uncovered and has the potential for water damage. Otherwise, I am extremely pleased with the shed and would definitely recommend purchasing from Shed Liquidators to anyone. Had Shed Liquidators sell me an 8x8 gambrel shed for the best price I could find with heavy duty floor and they sent a shed bulider(1 guy) on a Saturday and had it built and finished in 4 hours complete and cleaned up. Excellent job, excellent value! For the most part this is a great company to work with. Took two guys a little over two hours to build the shed. The only complaint would be that some of the nails from the nail gun were not straight, so there are pointed ends of nails sticking out of a few of the boards. No leaks. The shed was installed damaged and inadequately. It took weeks to get installers to come out and fix the problem...and the installers made the situation worse. After waiting several more weeks and filing a complaint with the better business bureau, the structure's shortcomings were finally addressed within reason, tho I still spent an additional $100.00 in lumber to shore up the roof (center beam is a 2x3), install additional support beams and put down a 5/8 plywood floor over the particle board flooring that came with the shed. You would figure for an additional $100.00, shed liquidators would do this automatically. Regrettably,this is not the case. It should not take 3 attempts to install a shed properly. It should not take countless calls to local and national phone numbers to initiate corrective actions and it definetly should not take a complaint to the better business bureau to right a wrong. This is a 2nd one I bought from Shed Liquidator. It looks and build quality. 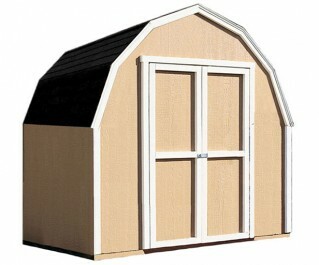 I have purchased two of these sheds in the past couple of years. I use them for livestock houses for goats and potbelly pigs! They all absolutely love it and will be purchasing a couple more for houses for more potbelly pigs! They are great during the winter and keep all my babies warm!! The shed is great, but what impressed me the most was the guy who installed it. He did the entire thing by himself and worked in the dark in order to get it done. In fact, all of the customer service was excellent. I ran into a snag with the corporation I live in after I had made my purchase. They had no problem working with me to adjust my order and refund the difference in price. This was an extremely pleasant buying experience.